The tin-bearing middling obtained by flotation in Huanggang, Inner Mongolia, is with SnO2 content of 3–5 wt%, which was stacked and cannot be utilized, leading to the tin resource wasting and environmental pollution. 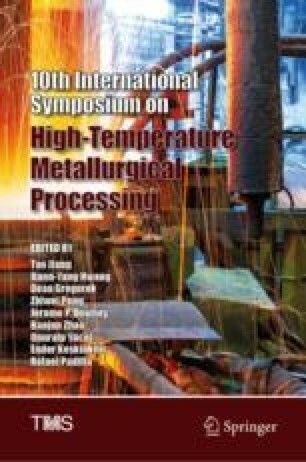 In order to recover this tin resource, the tin volatilization behaviour in the tin-bearing middling during carbothermic reduction in rotary kiln process was studied in this paper. The results show that the volatilization rate can reach 87.4% and the SnO2 content in the residue decreased to 0.57 wt% under the conditions of Kiln tail: Kiln middle: Kiln head (coal addition ratio) with 1:2:7, the proportion of ball and coal was 20 kg: 20 kg and the pellets size was 5–10 mm at 1000 °C for 2 h. The research could provide a technical reference for the utilization of the tin-bearing middling.